Bhubaneswar: The coveted Smart Logistics Summit (SLS), 2018 takes place on Tuesday, 19th June at Mayfair Convention, Bhubaneswar. In the second edition, the annual cargo and logistics summit has found traction among some of the tallest industrial leaders from Odisha, and stalwarts from port, shipping and logistics sector. The business leaders joined together to discuss logistics scenario in the region, and in a dynamic trade environment how logistics can play a decisive role to achieve manufacturing and business efficiency. With an overwhelming response from manufacturers, ports, terminals, importers-exporters, logistic & freight forwarding companies and other stakeholders to the first edition of Smart Logistics Summit and Awards in 2017, the annual cargo and logistics summit is back again in Bhubaneswar. 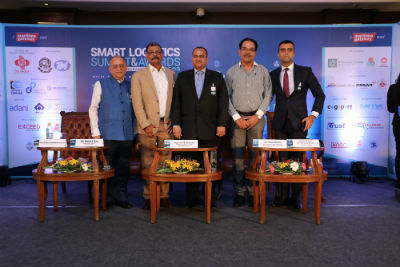 The journey of ‘Smart Logistics Summit & Awards’ began with Bhubaneswar, and later it was conducted in Hyderabad, Amaravati, Bengaluru, New Delhi, Kolkata and Nagpur. The potential of Odisha is immense as an industrial, mining and EXIM hub. And now the port and logistics sector is fast shaping up to meet the demand of trade. Gone are the days when logistics used to be seen just as a means to transport cargo from point A to point B. With digitalisation, and advancement in supply chain management, logistics is now part of core business strategy for companies who know how to gain that extra mile over competitors through efficient, modern and reliable supply chain. Sea, road, rail are no more separate modes of transport since the advent of multi-modal transit system. Sea is no more reserved for only EXIM cargo. With effective use of all available modes of transport, companies are gaining competitive advantage over peers in the manufacturing process by optimisation of cargo movement from mines to factory, and factory to the port and onwards. SLS is an effort in the direction of reaching out to the industries, exporters and importers to highlight the logistics bottlenecks in the region and explore how service providers could offer better solutions to facilitate business growth. The “Smart Logistics Summit & Awards” provides an insight on how Odisha moves cargo between hinterland and ports, and also showcase the new-age supply chain revolution to improve business efficiency. In the evening, a glittering night of ‘AWARDS’ recognizes outstanding achievements and exceptional accomplishments of individuals and organizations in manufacturing, EXIM, ports and logistics.